Bruce Sanguin shared 10 succinct pegs for evolving practitioners of the Jesus way to hang their hats on at the Common Dreams Conference in Canberra tonight. Kick the apocalyptic habit. Things ain’t all bad, indeed the world is ablaze with the glory of God if one cares to look. Be inclusive of the tradition that nurtured you and provided your confessional DNA. Affirm providence – the loving nurture that pervades the cosmos. Get out of your heads – drop into your yearning. In avoiding the fear of the irrational, do not neglect to embrace the trans-rational. Return to the wisdom of the body – personal and planet – remember the Christian faith is incarnational. Redeem legacy of indigenous wisdom through listening to first peoples elders. Complain less and build the Kingdom of God more. Looking forward to meeting the author, Bruce Sanguin, as he conducts a workshop at Dayspring, Saturday March 5th, and service and forum the next day at Wembley Downs Uniting Church. My concern, however, is not with the fundamentalist strain of Christianity. Rather, it is with the liberal and so-called “progressive” Christians. We, who accept—and even celebrate—the scientific method and its findings, have been slow to incorporate the evolutionary nature of reality into our theology and liturgy.We do not know conclusively if Darwin lost his faith because of his discovery. We do know that the theological models available to him were limited. There is no reason for the science of evolution and the theology of Christianity to occupy separate domains. We do not need to choose between the two, as recent scientific materialists like Richard Dawkins claim we must. Science and theology represent two different ways of knowing—one focussed on the exterior dimensions of reality and one that includes the physical world but also validates, celebrates,and develops the interior, nonmaterial realm of human experience. 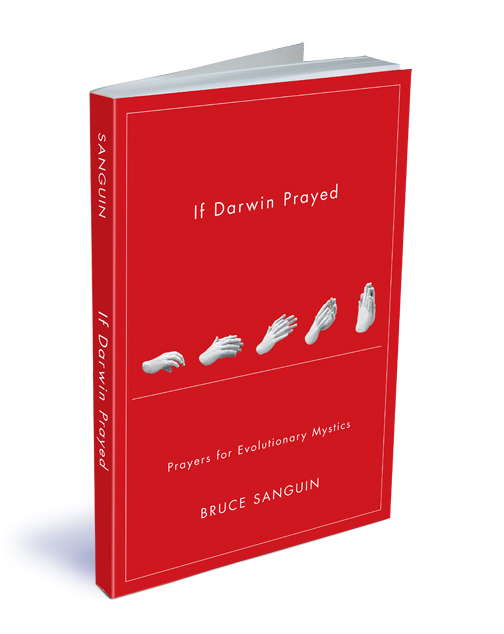 See more of who he is and what he does at If Darwin Prayed – Evolutionary spirituality and the path of Christ — Prayers for Evolutionary Mystics.